Designing a habitat for the lunar surface? You will need to know more than structural engineering. There are the effects of meteoroids, radiation, and low gravity. Then there are the psychological and psychosocial aspects of living in close quarters, in a dangerous environment, far away from home. All these must be considered when the habitat is sized, materials specified, and structure designed. 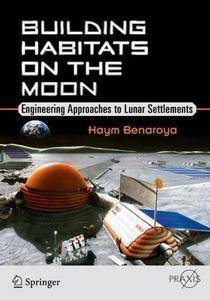 This book provides an overview of various concepts for lunar habitats and structural designs and characterizes the lunar environment - the technical and the nontechnical. The designs take into consideration psychological comfort, structural strength against seismic and thermal activity, as well as internal pressurization and 1/6 g. Also discussed are micrometeoroid modeling, risk and redundancy as well as probability and reliability, with an introduction to analytical tools that can be useful in modeling uncertainties.